DeLoach Fence Co. is family owned and operated, with more than 25 years of experience in the fence business. We install wood, vinyl, aluminum and chain link fences. 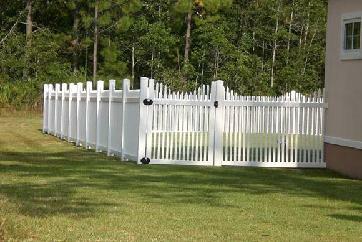 DeLoach Fence works with both residential and commercial customers in Southeast Georgia and Northeast Florida. We are an honest and dependable company that offers free estimates and reasonable prices. We’ll do any job from a backyard swimming pool to baseball fields, and we guarantee your satisfaction. With your fence needs and desires in mind, DeLoach Fence has developed their company to better serve you! If you have any questions or requests, our friendly staff members are always standing by and ready to help in any way that they can. We are dedicated to excellence through your 100% satisfaction. © Copyright 2009 Deloach Fence Company, Inc. All rights reserved.